Russian Su-24s carried out low-level flights close to USS Donald Cook while the warship was underway in the Baltic Sea on Apr. 11 and 12, 2016. As we have previously reported, on Feb. 10, 2017 U.S Navy destroyer USS Porter was buzzed by multiple Russian military aircraft in the Black Sea. According to Captain Danny Hernandez, a spokesman for U.S. European Command, the encounter involved three Su-24 Fencer attack aircraft and a Il-38 May maritime patrol aircraft. The video in this post was released by U.S. Navy on Mar. 2, 2017 and shows the three Fencers buzzing USS Porter. Noteworthy one of the Su-24s came within 200 yards of the Porter at an altitude of 300 feet. While the Pentagon deemed the incidents as “unsafe and unprofessional,” the Russian Ministry of Defense denied that such encounters took place. 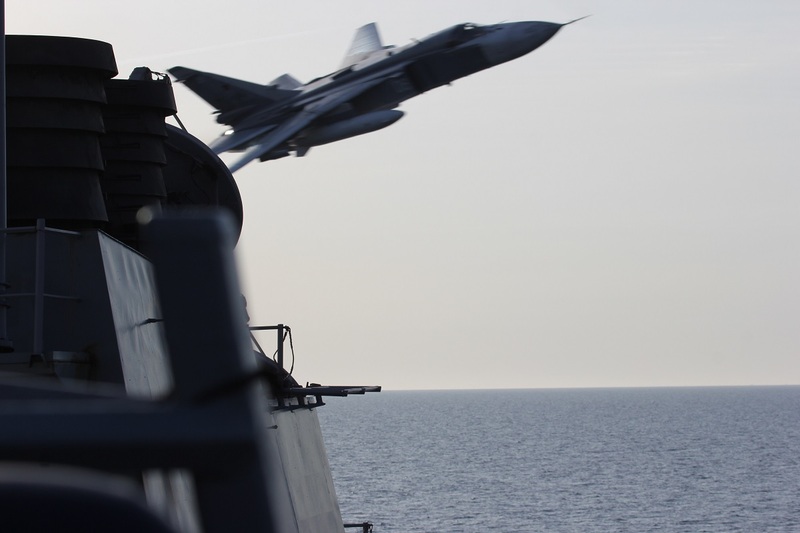 However this kind of incidents between Russian military aircraft and U.S. Navy ships are becoming quite common: on Apr. 11, 2016 in fact two Su-24s flew simulated attack passes near U.S. guided missile destroyer USS Donald Cook in the Baltic Sea so close that they created wake in the water.